The Sravana Nakshatra is nestled snuggly in the center of Capricorn. This Lunar Mansion is immortalized by the 3 stars that outline Aquila, the Eagle’s wings. Easily identified with the naked-eye, the eagle is tucked in at the top of the Capricorn constellation. 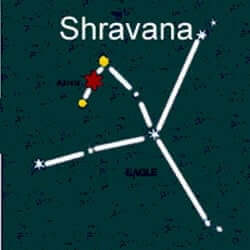 It is told that these stars represent 3 steps taken by Vishnu in his efforts to restore order to the cosmos. These steps indicate the tri-modal nature of the Universe and the laws under which it operates. There are several symbols associated with this birth star and the word itself speaks to 2 key aspects of the region. Shravana can be translated to: the one who limps, and/or the hearing one. 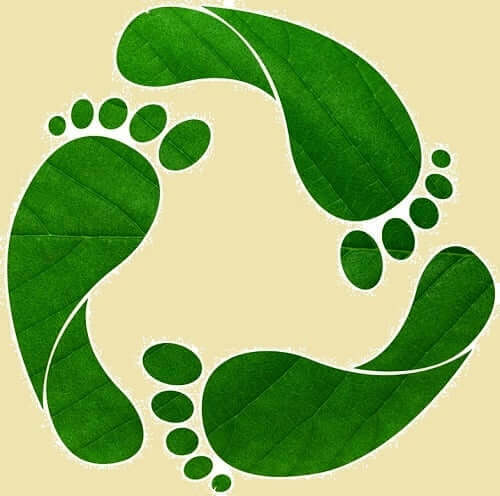 The limping one is indicative of Vishnu’s celestial footprints and this aspect of the Nakshatra is often represented as the 3 uneven footprints. An ear is also used to symbolize this region which infers a strong ability to learn by listening. An alternate name for the Shravana is Ashvattha, which is a name for the type of tree under which Buddha achieved self-realization. Some Jyotish astrologers combine the symbology and are known to use 3 ears or a tree of ears as their symbol for this area. Strong mind, quick wit and high energy are characteristics generally associated with natives of the Shravana. Very affectionate and compassionate they easily lighten the mood and are good at making people laugh. Generous humanitarians with spunky attitudes (think baby goat) they are adored by friends and family alike. Generally attractive, these engaging people are known to have a mole, scar, or other visible identifying feature. Loyal and honest, they have gentle and pleasant personalities. Peace loving, with natural charm, these people like to organize and may become overwhelmed my too much clutter. They will encounter challenges throughout their lives and they are able to confront the challenges while maintaining their dignity. Native Shravana’s are smart and savvy. They will have many occupations in their younger years and generally find their professional calling in their early 30’s. These people are known to excel in engineering, oil and gas, information technology and mechanical engineering. Some Sravana Nakshatra’s have a love of debate and will be drawn into the political realm. The Sravana native is known to have a challenging childhood. The family may move a number of times in the children’s early years. As adults, they are prone to create stable environments for their spouse and children. Generally healthy folks, they may experience periodic bouts of eczema and indigestion. On occasion the native may be prone to respiratory issues and/or rheumatism.